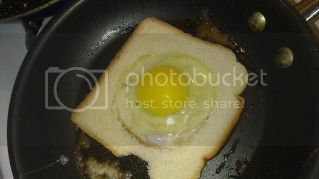 Recently I discovered somewhere something called egg in the hole. 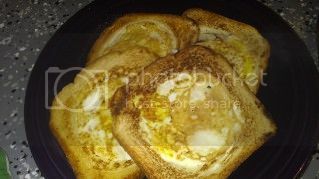 It is an egg fried inside toast. Brilliant right?? I had to try it! And let me tell you it is easy peasy! And YUMMY! 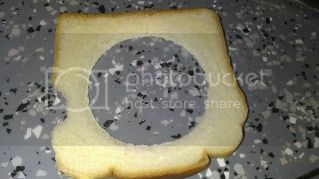 Get a cookie cutter, small cup or other item to make a hole in the bread. I used the top of a Chuck E Cheese cup. Your pan should be nice and hot by now. Place your bread in the pan. 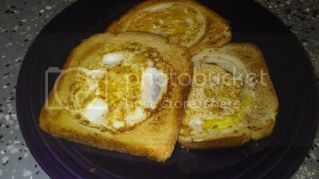 Grab an egg, crack it open and slowly pour into the hole you cut out of your bread. 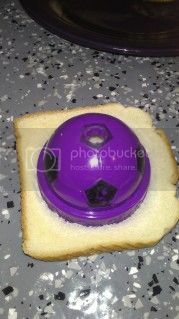 Allow bread to toast on that side. 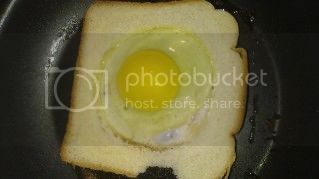 You will see the egg starting to cook. I waited till my egg was fairly solid (but yet done) and slowly flipped over the bread.By waiting till it was a cooked enough to be solid made the flip easier. If you do it too soon you will have raw egg every where. Wait till that side is toasted. Flip over and be sure both sides are as you want them. For me this was also enough time for the egg to cook nicely! The whole family LOVED this! We had breakfast for dinner and it was awesome!